Eating sushi is an artful experience, with different tastes and textures in harmonious balance. Ginger is used to cleanse the pallet between different rolls, allowing your mouth to be neutralized with the slight spicy heat of ginger. Ginger is the perfect sushi companion, allowing one to fully appreciate every nuance in the dish that is being enjoyed. Ginger is also used as a garnish and as an essential element in sushi-ya presentations. Ginger is a plant native to Asia which has been used for its culinary and medical property since time immemorial. The plant is pickled, preserving it for use in sushi. The pickled version of the plant is known as “Gari”, and it has been commonly used not only as a delicious palate cleanser and garnish but also in order to quell stomach pains. Sushi lovers have often noted that they feel healthy and whole after a meal, and ginger could be a part of the equation. Of course, it is natural to feel good after a healthy and delicious meal, so it could be that the effects of ginger are overstated. While the medicinal properties of ginger are up for debate, the balance it creates with fresh, delicious sushi is unmistakable. Ginger is pale yellow or pinkish when used in sushi, and will provide an artful hue for your presentations. 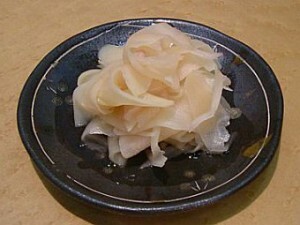 This coloring is caused by the pickling process, which is done by marinating sweet young ginger in sushi and vinegar. This creates a naturally tender and sweet ingredient for use in your sushi presentations. Ginger is best enjoyed in between rolls, as the tastes will be disharmonious when eaten in conjunction with a morsel of sushi. Ginger is the perfect sushi companion because it cleanses the palate and allows for a proper and full enjoyment of the myriad of delicate flavors found in sushi. While ginger is perfect as an accompaniment to sushi, gari is quite a versatile ingredient. It can also be enjoyed in stir fries, with noodles, or in salads. When eating ginger with sushi, it is only necessary to provide around 10 grams, or a third of an ounce with each presentation. Of course, ginger lovers may decide that more is necessary, and rightly so!